As there simply wouldn’t be enough room for all the information regarding my own studio; I have put together some specific frequently asked questions. If you have any questions you would like added to this page, please feel free to contact me using the ‘contact’ page and form. Thanks again for being here. A: After trying lots of different ones from Cubase, Fruity Loops etc…, I settled for Studio One Pro from a company called Presonus as my main Digital Audio Workstation (DAW) of choice. It has a super layout & workflow pace, is very user-friendly, and is very stable when using it with a PC. It generally does everything I need – and does it well. Q: How long did it take you to get your studio to where it is today? A: The studio is still growing, but it has taken roughly a year to get it to where it is today. Q: You use a Br1600 and a computer – which do you prefer & what’s the difference in the two? A: They’re both great in their own right and I suppose they really do the same thing but in very different ways. The BR1600 is basically like a mixing desk but has a lot of stuff built into it making it able to record music and vocals. It can even burn an audio CD of your project. The sound quality is fantastic for such a compact system, and it claims to be a ‘go anywhere’ digital recorder which is great if someone wants me to record them at a certain location. The computer-based side of things is pretty much what it says and has much more scope in general. Computer-recording software can be tweaked with extra software to fine-tune to your needs. I’d have to say that I now prefer working on a computer, simply for the fact that I have it the way I want it. Although the BR1600 is a great unit, a computer is capable of doing much more. Taking this into account – the two of them work very well together, with no loss of quality. Q: Do you work with other people in the studio? A: For the most part I work alone. There are times however when I will use a guitarist depending on the project I’m working on at the time. It’s always good to have that second pair of ears, and with the help of the internet, I can send a song anywhere in the world and have a friend listen to it for their feedback if I’m on the right track. The same applies if someone wants me to work on something they’ve created – they send me a file, I work on it and send it back to them. Q: I’m an OK singer, could a recording studio make me sound better? A: This is a tricky one, and I’ll be as honest as I can. A lot of people think they are better than they really are – either their family or friends have told them they are fantastic singers or players. You only need to watch some talent shows on television to see this. Recording in a studio can be a double-edged sword in many ways. If there is talent there, then a good engineer will hopefully ‘enhance’ that talent; however, it can also work equally the other way around by enhancing any faults which may be present. I have recorded people who believe they are the next Adele or Garth Brooks and when they listen to themselves back they realise there may be some work to do. At the end of the day there are tools we can use in an attempt to make somebody sound ‘better’, but there will never be anything to replace natural talent. I think most studios will agree. Q: What is a plug-in and do you use any? A: A plug-in is extra software you add onto your computer recording program – normally to make your project easier to work with or sound better. I use lots of different plug-ins depending on what I’m working with at the time. As I write, record and produce music, I need special software to help me with ‘all’ these factors. As mentioned earlier, there are plug-ins to make your voice and music sound better, plug-ins to add effects; and even plug-ins to give you extra instruments. Whatever you can think of, there is probably a plug-in that will do it. Some are free – which is great, whereas some packages will cost up to £12,000+ depending on the quality of what they do. How you use them are key, and once again – if something sounds good to start with, they’ll help a great deal. A: That’s a tough one. On a personal level – people who have made good a bad situation would rank up there. Someone who is a natural at what they do yet can’t ‘see it’ – or ‘can’ yet have their feet on the ground would also make their mark. I think it’s always important to remember where we come from, however successful we may become. Musically – there is so much local talent out there at the moment it’s so difficult to pin-point any particular person or thing. I have a few people who have, and continue to inspire me today, and who I have huge admiration for. Of course there are bands in the professional music industry who I love – especially when I learn about their backgrounds and discover it wasn’t always plain sailing for them getting to where they are today. As for ‘what’ inspires me the most – anything which makes me think longer than I should. Chances are the thought will probably end up laying the foundation for another song somewhere down the line. Q: If someone wanted you to record them, what would the first steps be. A: If I’m going to record someone then, ‘for me’, it’s vital that I find out as much as possible about them. Not in a stalker-type way (joke), but rather just to find out if they’ve any experience or if this is their first time being recorded. A lot of people I’ve recorded just want a demo of themselves singing a favourite song – others want a fully-crafted EP (a 4/5 track CD); some will have lots of singing experience, others will maybe never have been in front of a mic before. Being recorded in any sort of studio is very different from singing along to your favourite song in the car. Nomatter how long anyone has been singing, the one thing which usually surfaces is a case of ‘nerves’. Being nervous with the thought of being recorded can totally ruin a great voice, dent any confidence, and make the whole recording experience an unpleasant one. Saying this, I’ve also recorded people who were almost ‘too excited’ and ready to go with a ‘get it done’ attitude. Focus on the project at hand is paramount – with a laid back attitude of course. A few tips to help with your recording project is to know what you’ll be doing. Pick a song you know well – reading words off a sheet while being recorded often takes the ‘feel-factor’ away from the recording. Don’t be afraid to ask questions – every recording engineer I know wants you to be happy with the results and to enjoy the process – at least they should. Q: What other equipment do you use, if any? A: I’ve built up quite a lot of stuff over the years – especially over the past few months with wanting to build up the recording aspect of things to as high a standard as is possible. 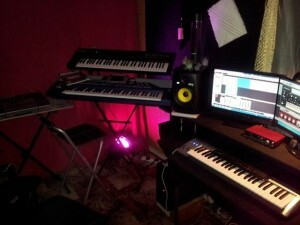 I use a custom-built computer for my software (Studio One Pro) with a Focusrite (2i4) audio interface for connecting instruments. Coming from a keyboard background I use 2 Korg Keyboards along with an M-Audio midi keyboard for – well, recording midi instruments and some drum parts. For acoustics I use a Takamine guitar through various processors. For vocals I use Audio-technica and Behringer microphones which I use with a surround to help block out any background noise. All my sound comes out through a tri-monitoring system consisting of two main KRK Rokit 6’s and a small Behringer which is handy for mono listening – I also use a pair of KRK & Sony studio monitoring headphones. Finally, I have a couple of monitor screens which are handy for arranging workloads on-screen. It may not be Abbey Road, but I like it, and it seems to work for me. Q: What are your future plans for the studio and the work you do? A: I’m actually pretty content with the technical aspect of the studio at the moment. I would maybe like to expand the actual size to allow bands to come and go but that will be much further down the line. In the meantime I’m wanting to raise the profile and hopefully work with some other great musicians and songwriters. As for where my music is going – I have a few plans and projects coming up. I’ve started working on some instrumental music and hope to be sending them off for use in films and television – however, it’s early days and the competition is fierce. We’ll see what the future holds – nothing ventured, nothing gained.